Home → Blood Sugar → KetoActiv Powder by Sunforce – Now Available in Calgary! 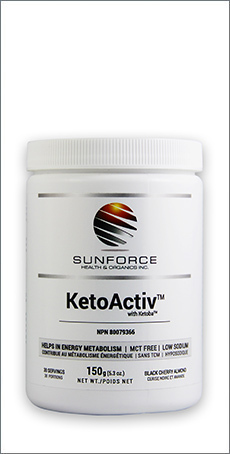 KetoActive by Sunforce: the Ketogenic supplement to increase energy is now available at Vitamins First in Calgary. Whether for weight-loss, athletic performance, mental clarity or anti-aging, KetoActiv™ is an exogenous ketone that does not induce gastrointestinal distress, as is common with MCT-based products. KetoActiv™ is a powder that when mixed with water helps control appetite, curb cravings and increase energy. The combination of beta hydroxybutyrate (BHB) and butyric acid (BA) work together to activate the liver, draw fat out of the body and metabolize it for energy. Best of all, it tastes great. KetoActiv® promotes mental focus and clarity, supports cognitive health, reduces inflammation, improves strength and endurance, preserves and protects the muscles and provides healthy blood sugar levels in diabetics. In a fasting state, mix 5-grams of KetoActiv powder into a 16-ounce bottle of water. Drink the first 8 ounces, then add more water to the bottle and sip throughout the day to curb the appetite and provide energy. Non-Medical Ingredients: Natural flavors, Inulin, Stevia Extract. Citric Acid, Malic Acid, Silicon Dioxide, Beet Powder (for colour), Beta Carotene (for colour).